Pablo Martínez (1989), trombone player and flamenco singer. Studied classical music in Murcia (Spain), graduating in trombone in 2011. Martínez has worked with musicians such as Jorge Pardo, best European jazz musician 2012 by the Académie du jazz de France, and Josemi Carmona, best guitarist of his generation, according to the Maestro Paco de Lucía. This led to playing at major festivals in Europe, such as the North Sea Jazz Festival 2013 and the Madrid Jazz Festival 2011, and also the recording of the album Huellas by Jorge Pardo. 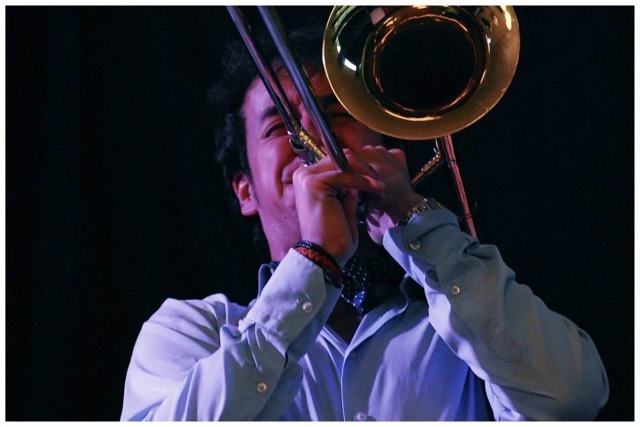 Currently Pablo is studying Master’s 2nd year in jazz trombone at the Conservatorium van Amsterdam, as well as working on his own band “Pablo Martínez Flamenco-Jazz Band”, as a flamenco singer, in salsa bands such as the “Latin Society” and as a freelance musician.